50% OFF SALE - LIMITED TIME. Apple featured "New apps we love". 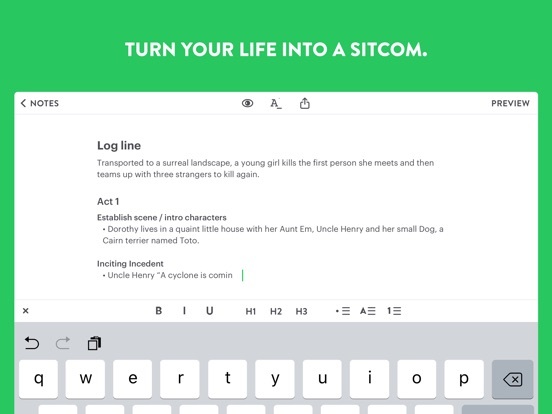 Untitled is a powerful screenwriting and note taking app, from the Lead UIUX designer at Vimeo. Not a screenwriter? Not a problem. 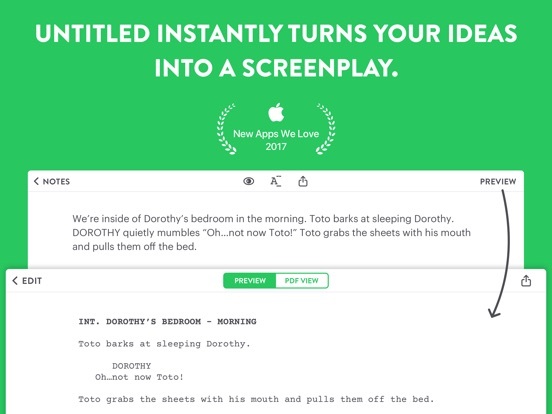 Untitled can instantly turn your notes into a fully formatted screenplay. Develop your stories, build compelling characters, draft heart-stopping scenes, and transform your notes into a screenplay. Perfect for ideas, first drafts and everything in-between. - iCloud Versioning - Never lose an overwritten thought! 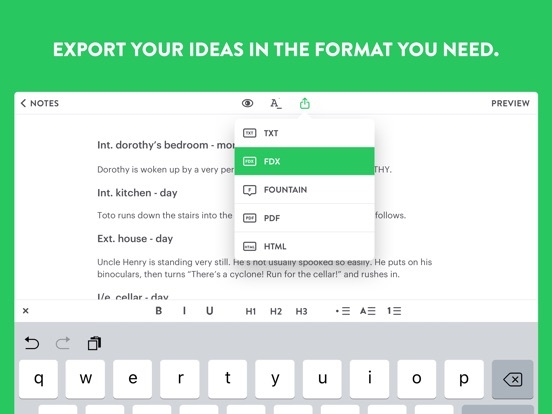 - Split View & Slide Over now fully supported - Jot ideas while you research! 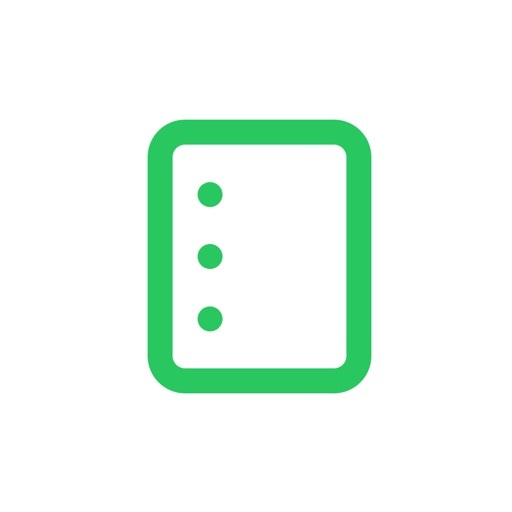 - Quick notes - Jot your screenplay notes and ideas as soon as you open the app, all in one place. - A simple, beautifully crafted editor with a highly legible font that reduces writer's block when writing your story. - Write Now, Preview Later: Write without the pressure of writing a perfect first draft; Preview in the industry standard screenplay format. 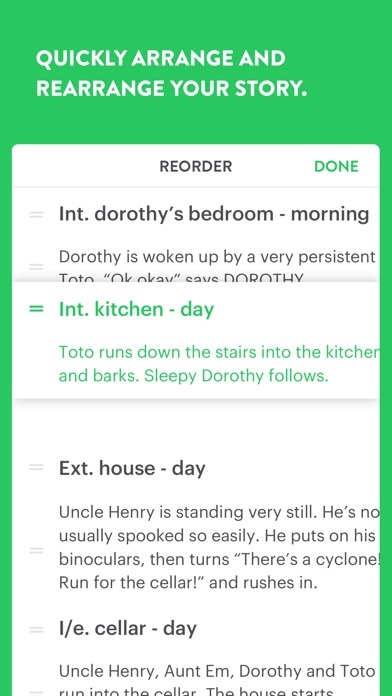 - One Touch Reorder: Quickly arrange and rearrange your scenes, or ideas in Untitled with the new reorder menu. Say goodbye to your note cards! - Pro Export Options: Export your masterpiece to .fdx, .fountain, .txt, .pdf or .html. 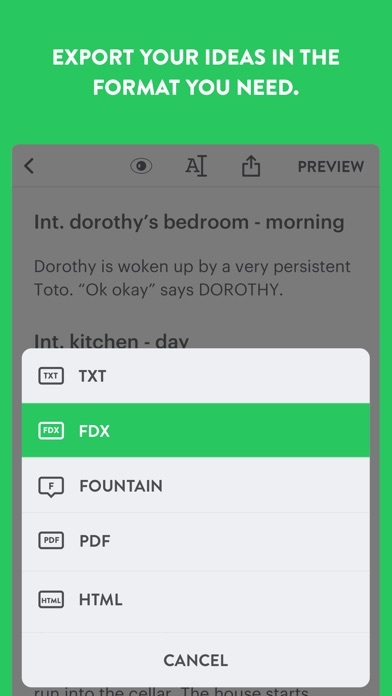 - iCloud Sync: Sync what you write in Untitled across your iPhone and iPad. - File Format: All documents created in Untitled are .fountain files by default. - Easy Import: Import .txt and .fountain scripts from iCloud, Google Drive, Box, Dropbox, and more. - Auto Save: Untitled auto saves your notes while you write them so that you never lose an idea. - Focus Mode: Enter a clean writing environment so that you can focus on your ideas, characters and story. - Writing Font: Untitled uses a customized version of Graphik for increased legibility over Courier when writing. 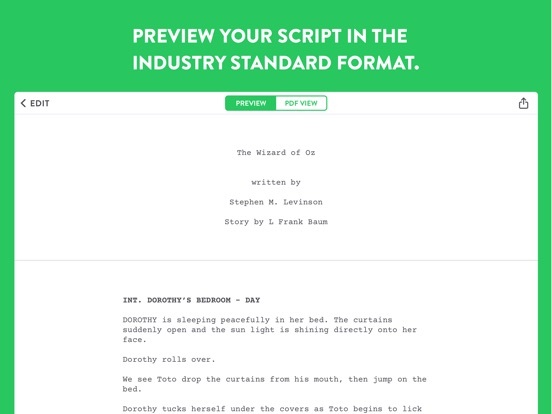 - PDF Preview: See an unobstructed view of your screenplay within the Preview window. - Font Size Accessibility: Untitled now supports font sizes under Accessibility iOS Settings. Adjust for larger fonts when writing. - Keyboard Support: Connect your Bluetooth keyboard for an even better writing experience. 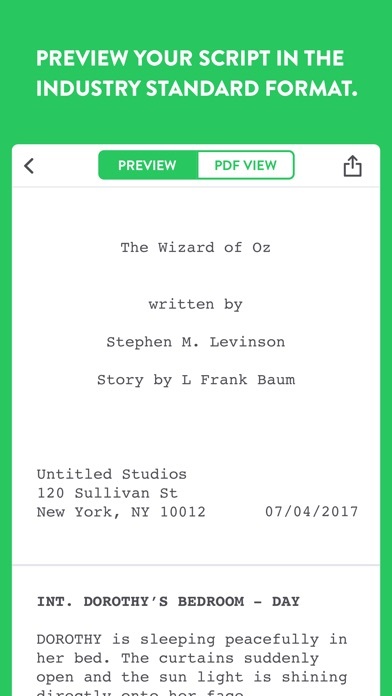 - Magic Script Formatting: Untitled instantly turns your stories into an industry standard screenplay. 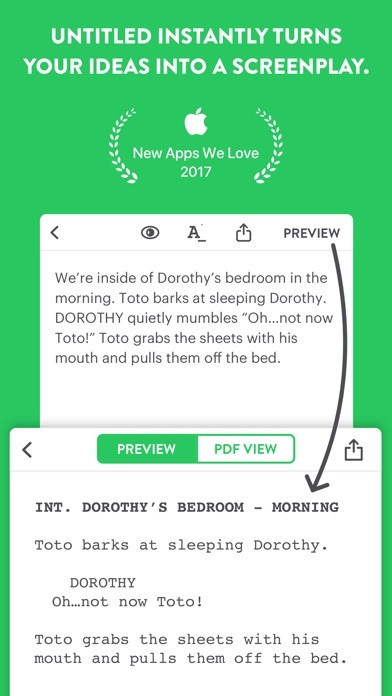 - Writing Guide: Learn the ins and outs of Untitled from within the app. Ready to write your best screenplay? Download now! 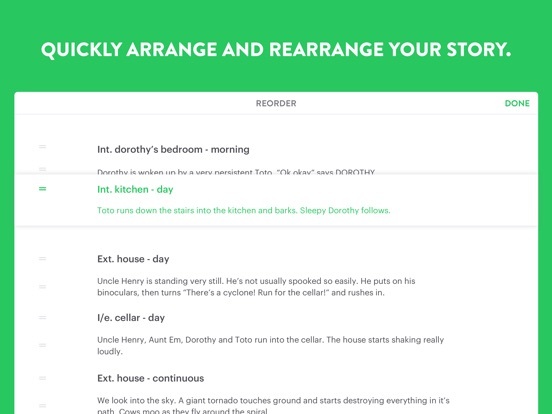 Untitled instantly turns your notes into a fully formatted screenplay. Not a screenwriter? Not a problem. All you need is your imagination. 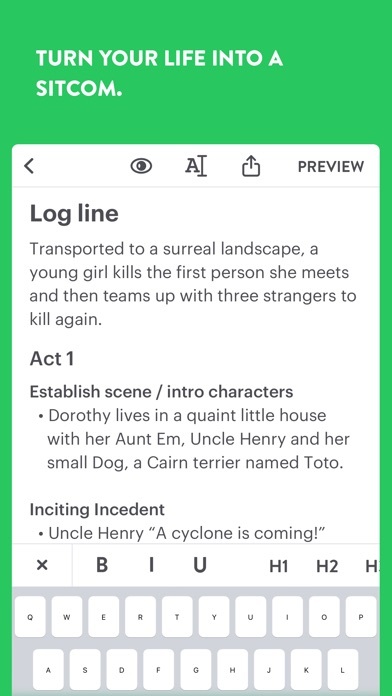 From the creator of the #1 screenwriting mobile app, Scripts Pro, comes Untitled – A creative place for you to develop your stories, build compelling characters, draft heart-stopping scenes, and transform your notes into a screenplay. Be prepared for inspiration when it strikes and you’ll never lose another brilliant scene idea again. Perfect for ideas, first drafts and everything in-between.